Ever since we created Pic Scanner in 2013, users have been clamoring for this feature. 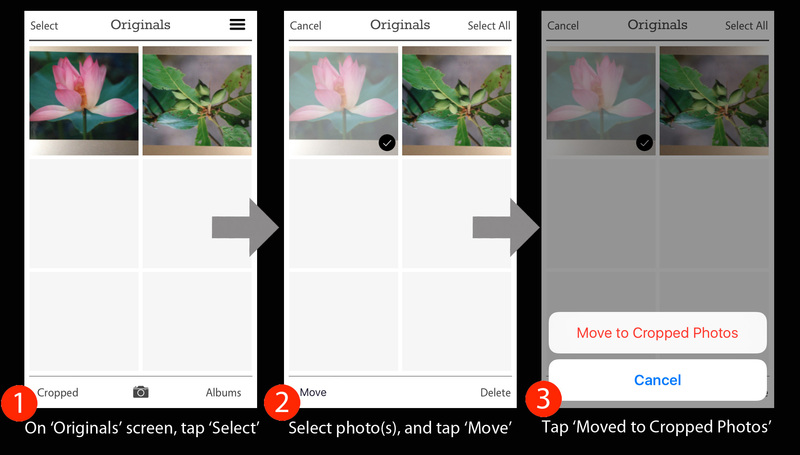 In version 4.0 of Pic Scanner, we have added the ability for you to move one, multiple or all un-cropped photos from Originals to Cropped gallery. Once you do this, you can share & save them to Photos (Camera Roll), upload to Dropbox, Facebook etc., or add to Albums. In other words, do pretty much whatever you can with Cropped photos. Go to Originals screen, tap Select button on top left, then touch the thumbnails of all the photos you’d like to move. They’ll get check marked. Now tap the ‘Move’ button on bottom left, and select ‘Move to Cropped Photos”. Done! It’s as easy as that. We should, however, mention, that if you are having to move a lot of photos from originals to Cropped screen, you are not scanning the right way. You are probably holding the camera too close to the pictures being scanned. The correct way to scan is to make sure that not only are the photos fully visible, a bit of the background is also visible all round. This will ensure that the photos are auto-cropped correctly, and saved on Cropped screen – eliminating the need to move photos from Originals to Cropped screen.